The Palwal Coop. 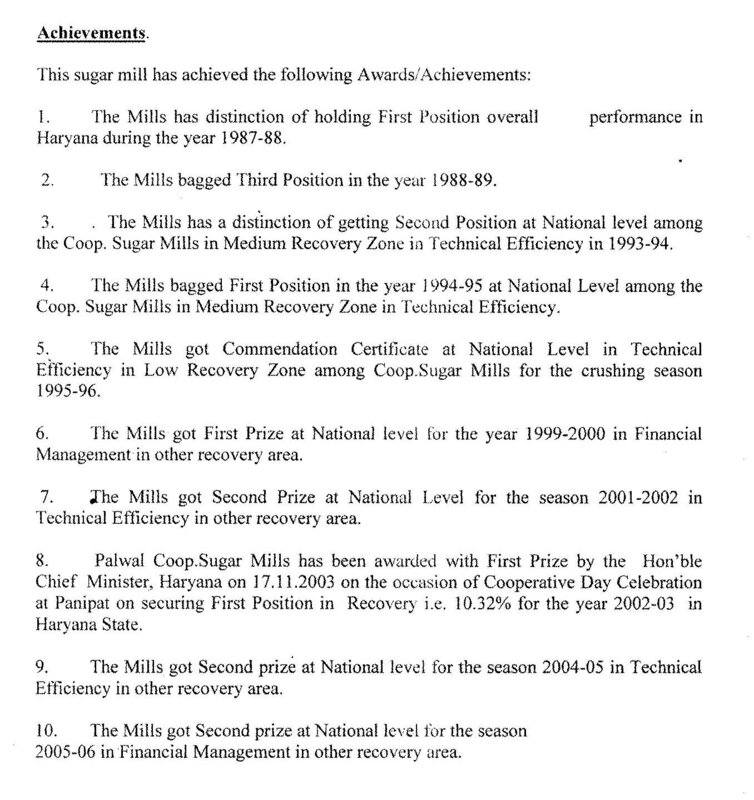 Sugar Mills Society was registered under Cooperative Societies Act on 8.11.1973, for establishment of Sugar Factory of 1250 TCD which was commissioned in the year 1984-85 in order to boost up the Cooperative Movement in India. This is a primary type of Society directly linked with common people/farmer of the area. The mission of Society is to produce sugar and to upliuft the economic condition of the farmer in the area as well as to link them with Co-operative Movement of India. The area of operation of this mills is 32km radius The number of villages falling in 32kms. radius are 398 from where the sugarcane is supplied to the Mills. The total share holders are 39,660 and the share contribution is 2033.99 lacs. Out of this the share holding of the state Government is 1693.oo lacs. The farmers attaining at least 18 years of age and citizen of India who produce sugarcane and supply it to the Sugar Mill are eligible to become share holders. The Mills is governed by its Board of directors consisting 17 Directors. The deputy commissioner of District is Ex-Office Chairman Of the Board of Directors and Managing Director is the Member Secretary. 12 Director are elected by the share holders/farmers and one is co-opted. 5 Director including the chairman and Managing Director are Government Nominees. The Vice-Chairman among the Director is also elected. At present there is Board of Director w.e.f 26.06.2011 for a period of 5 years.